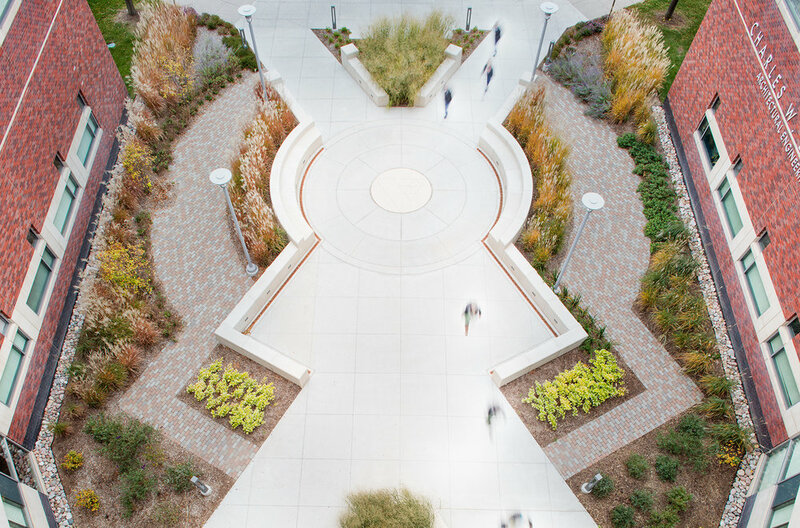 As part of a larger building renovation, Vireo was hired to provide design and documentation for the renovation of the Peter Kiewit Institute Entry Plaza on the University of Nebraska - Omaha Pacific Campus. The redesigned plaza incorporates geometry of the original design in a way that enhances entry to the iconic building. Site walls and pavements define space, provide scaled seating opportunities, and improve drainage within the plaza. Plantings soften the plaza and aesthetic of the “hard” architecture. Grasses and flowering perennials add to the pedestrian scale of the space, and were selected for hardiness and adaptability. Since construction was completed in 2014, the plaza is used by students for study, impromptu classes, and regular campus transit stop.